In “Kevin and Me,” a video by the black performance artist Dave McKenzie, the camera focuses downward on the artist’s legs and feet as he walks along a wood-planked pedestrian bridge. One of his legs is twisted, causing him to limp. As he advances he begins to walk more naturally until he’s moving normally, at which point he stops to doff his sneakers and puts on a pair of tap shoes awaiting him at a steel joint in the walkway. He then executes a series of precise dance steps along the narrow metal band. Movie buffs will recognize this as a clever riff on the end of “The Usual Suspects,” in which Verbal Kint, played by Kevin Spacey, morphs from the loquacious simpleton he’s been pretending to be into the criminal mastermind he really is. Seeing the video in “Radical Presence: Black Performance in Contemporary Art,” an entertaining and philosophically stimulating exhibition at New York University’s Grey Art Gallery, viewers may also read it as an allegory about being black in today’s America. Too often our still white-dominated, mass entertainment media portrays black men as belonging to one of two groups: a large one of bums, defectives and criminals and a tiny one of magically gifted athletes, musicians and comedians, leaving a broad sector of more or less ordinary black citizens underrepresented. A remarkable thing about the exhibition is that much of it is in a comical vein, like Mr. McKenzie’s work. The show was organized by Valerie Cassel Oliver, senior curator at the Contemporary Arts Museum Houston where it opened last November. More than two dozen artists are represented in this show, and not all of their works take a humorous approach. 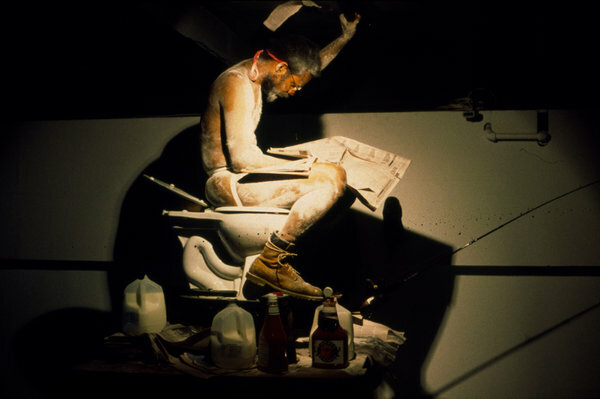 For example, in “Pretending to Be Rock” (1993), Sherman Fleming stayed on hands and knees under dripping candles until he could no longer bear the wax accumulating on his naked back. But since a strain of purposeful absurdity — as opposed to, say, didactic righteousness — can be found in almost every piece in the show, Mr. Désert’s observation could apply to the exhibition as a whole. That’s not just incidental. Comedy often turns on contradictions between appearance and reality. Mistaken identities abound in Shakespeare’s comedies and in modern movies like “Trading Places,” in which Eddie Murphy is transformed from a street-level con man into a wealthy investor whose polished demeanor fools the financial elite. Many of the exhibition’s works involve deceptive appearances. In 1973 Adrian Piper did a series of outdoor, guerrilla performances as the “Mythic Being,” a menacing man with a mustache and an Afro wig. In the early ‘80s Lorraine O’Grady went to New York art openings as Mlle Bourgeoise Noire wearing a tiara and a floor-length gown made of stitched-together white gloves. In a soap-operatic video called “Conversations Wit De Churen II: All My Churen,” Kalup Linzy appears in several guises, female as well as male, talking in various dialects. For “Eating The Wall Street Journal,” William Pope.L, who bills himself as “the friendliest black artist in America,” appeared as a combination madman and shaman. Wearing only a jockstrap and boots, he sat on a toilet at the top of a 10-foot-high tower and consumed The Journal in strips with the help of ketchup and milk. Among the reasons for this penchant for role playing in black performance, you might cite W. E. B. Du Bois’s notion of “double consciousness”: the experience of seeing yourself “through the eyes of others” rather than as you know yourself to be. To exaggerate the disparity between outer and inner, comically or otherwise, can be a way to unsettle prejudicial ideas about identity. But there’s more to it than that. Between appearance and reality imaginative fields may open for the emergence of new realities and other ways of being not only black or white but human. If the sci-fi-psychedelic, digitally animated videos by the young artist and dancer Jacolby Satterwhite (born 1986) presage the future of black performance, it’s one that’s pregnant with mind-stretching possibility. For immediate purposes, there’s another half of the exhibition still to come. Part II will open at the Studio Museum in Harlem on Nov. 14. Many live performances are scheduled for the run of both shows, including a series coordinated with this year’s biennial performance extravaganza Performa 13, Nov. 1 to 24. Avant-garde performance by black artists has never received this much attention, so mark your calendar. “Radical Presence: Black Performance in Contemporary Art” runs through Dec. 7 at Grey Art Gallery, New York University, 100 Washington Square East, Greenwich Village; (212)998-6780, nyu.edu/greyart.